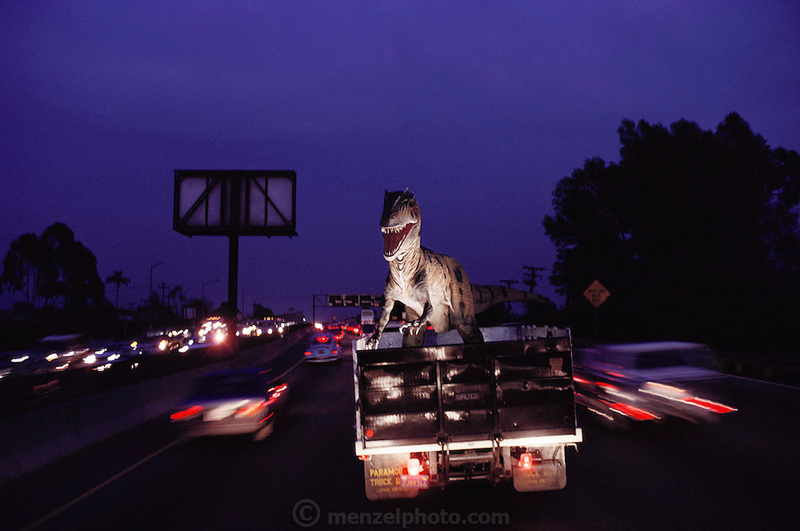 Snarling at the rush-hour traffic, this new animatronic; that is, lifelike and electronic replica of an Allosaurus is returning from the paint shop to the Dinamation factory in Orange County, California. Dinamation International, a California-based company, makes a collection of robotic dinosaurs. The dinosaurs are sent out in traveling displays to museums around the world. The dinosaur's robotic metal skeleton is covered by rigid fiberglass plates, over which is laid a flexible skin of urethane foam. The plates and skin are sculpted and painted to make the dinosaurs appear as realistic as possible. The creature's joints are operated by compressed air and the movements controlled by computer.